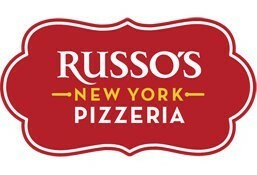 Russo's New York Pizzeria is currently closed for delivery and it will open at . Tender calamari seasoned with salt and pepper, lightly fried. Served with Russo’s homemade marinara sauce. Hand-knotted pizza dough tossed with Sicilian extra virgin olive oil, fresh garlic and Pecorino Romano cheese. Served with a side of Russo’s homemade marinara sauce. Grilled chicken, romaine lettuce, sliced avocado, arugula, cucumber, Kalamata olives, Roma tomatoes, feta cheese and pepperoncini, served with honey mustard dressing. Romaine lettuce, red onions, bell peppers, cucumbers, Roma tomatoes, red cabbage, black olives and Russo’s balsamic vinaigrette. Ricotta cheese, turkey ham and Wisconsin mozzarella, with Russo’s pizza sauce. (12 inches Serves 1-2 persons) Let your imagination be your guide and choose your favorite toppings from among our large selection. (16 inches Serves 2-4 persons) Let your imagination be your guide and choose your favorite toppings from among our large selection. (28 inches- Serves 8-10 persons) Let your imagination be your guide and choose your favorite toppings from among our large selection. Cooked with extra virgin olive oil, zero trans fat and gluten-free penne or spaghetti pasta is available. Italy’s most popular pasta served with Russo’s Bolognese meat sauce or homemade marinara sauce. Cooked with extra virgin olive oil, zero trans fat and gluten-free penne or spaghetti pasta is available. Penne pasta mixed in a spicy tomato sauce. Russo’s famous authentic New York-style pizzas are baked fresh to order in our brick oven. Crumbled beef, beef pepperoni, turkey ham and Wisconsin mozzarella, with Russo’s pizza sauce. Russo’s famous authentic New York-style pizzas are baked fresh to order in our brick oven. Grilled chicken with spinach, basil, feta cheese, Wisconsin mozzarella, Roma tomatoes, Sicilian extra virgin olive oil and fresh garlic. Russo’s famous authentic New York-style pizzas are baked fresh to order in our brick oven. Bresaola, arugula, basil, fig spread, Wisconsin mozzarella and balsamic glaze. Russo’s famous authentic New York-style pizzas are baked fresh to order in our brick oven. Fresh mozzarella, anchovies, capers, chili flakes, Sicilian extra virgin olive oil, fresh basil and Russo’s pizza sauce. Russo’s famous authentic New York-style pizzas are baked fresh to order in our brick oven. Crumbled Beef, beef pepperoni, roasted peppers and Wisconsin mozzarella, with Russo’s pizza sauce. Russo’s famous authentic New York-style pizzas are baked fresh to order in our brick oven. Sliced meatballs, beef pepperoni, red onions, ricotta cheese, Wisconsin mozzarella and Russo’s pizza sauce, drizzled with pesto sauce. Russo’s famous authentic New York-style pizzas are baked fresh to order in our brick oven. Fresh Portabella mushrooms, Wisconsin mozzarella and truffle mushroom olive oil sauce, topped with fresh arugula. Russo’s famous authentic New York-style pizzas are baked fresh to order in our brick oven. Fresh spinach, artichokes, white onions, mushrooms, Roma tomatoes, basil and Wisconsin mozzarella, with Sicilian extra virgin olive oil garlic sauce. Russo’s famous authentic New York-style pizzas are baked fresh to order in our brick oven. Grilled chicken, Portabella mushrooms, arugula, Wisconsin mozzarella, Kalamata olives, sun-dried tomatoes, gorgonzola cheese and Sicilian extra virgin olive oil garlic sauce. Russo’s famous authentic New York-style pizzas are baked fresh to order in our brick oven. Spicy chicken, red onions, Wisconsin mozzarella, Russo’s pizza sauce, spicy hot sauce and ranch dressing. Russo’s famous authentic New York-style pizzas are baked fresh to order in our brick oven. Grilled chicken, roasted peppers, broccoli, fresh jalepeños, tomato cream sauce and Wisconsin mozzarella. Beef bresaola, arugula, fresh basil, fig spread, Wisconsin mozzarella and balsamic glaze. Fresh mozzarella, anchioves, capers, chili flakes, Sicilian extra virgin olive oil, fresh basil and Russo\'s pizza sauce. Crumbled beef, beef pepperoni, roasted peppers and Wisconsin mozzarella, with Russo\'s pizza sauce. Sliced meatballs, beef pepperoni, red onions, ricotta cheese, Wisconsin mozzarella and Russo\'s pizza sauce, drizzled with pesto sauce. Fresh portabella mushrooms, Wisconsin mozzarella, and truffle mushroom olive oil sauce topped with fresh arugula. Grilled chicken, portabella mushrooms, arugula, Wisconsin mozzarella, kalamata olives, sun-dried tomatoes, gorgonzola cheese, and Sicilian extra virgin olive oil garlic sauce. Spicy chicken, red onions, Wisconsin mozzarella, Russo\'s pizza sauce, spicy hot sauce and ranch dressing. Roasted peppers, double beef pepperoni, Wisconsin mozzarella, ricotta cheese and Russo\'s pizza sauce. Grilled chicken, roasted peppers, pineapple, white onions, zesty BBQ sauce and Wisconsin mozzarella. Grilled chicken, roasted peppers, broccoli, fresh jalapenos, tomato cream sauce and Wisconsin mozzarella. Let your imagination be your guide and choose your favorite toppings from among our large selection. Russo\'s American tribute to pizza. Double beef pepperoni, mushrooms, onions, Wisconsin mozzarella and Russo\'s Pizza sauce. Comprised of four kinds of pizza: one fourth Cheese, one fourth Vegetarian, one fourth Mulberry and one fourth Chicken Rustica. The One that started it All! Our Famous New York creamy, smooth cheesecake with a Graham Cracker Crust. The best for the hot summer days and its ideal for any occasion too. A very refreshing and energizing drink rich in Vitamin C.
The unique Spuma is a refreshing caramel and herbal note with a sparkling lightness.